The Miami Heat will be at the United Center Thursday, and so will Derrick Rose. 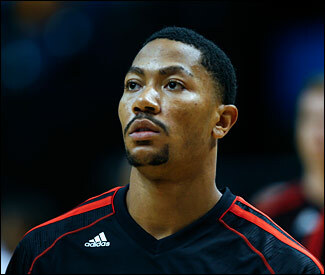 Rose’s surgery Nov. 25 was said to have gone well and after an obvious initial period of shock and despair, Rose is said to be positive about moving forward with his rehabilitation and preparation for the 2014-15 NBA season. For the first time since his season-ending surgery to repair a torn medial meniscus in his right knee, Derrick Rose will meet the media at 11:30 a.m. CT on Thursday following Bulls shootaround. Sometime before 9 p.m. after the great New York/Brooklyn rivalry game, TNT will pick up the Heat’s first visit to Chicago this season. It’s not exactly as the NBA and TNT schedule makers anticipated as while the Heat is 14-4, the Bulls are 7-9 and the Knicks and Nets are a combined 8-26 and even their players calling them laughingstocks. You know which three teams Charles Barkley will be making fun of. So instead of the anticipation of one of those early season statement games, perhaps the Heat will make a statement about how serious it takes the game by whether it plays Dwyane Wade. The Heat’s star 1B has sat out four of the team’s games to rest his tender knees, the last Tuesday when the Heat’s 10-game winning streak was broken at home by the Detroit Pistons. Now, Miami goes on the road after a heavy November home schedule with a four-game trip that concludes with their measuring stick game. It was the Bulls most of the last three years. It’s now the 17-2 Pacers as the Heat close this trip in Indianapolis Dec. 10 after stops in Chicago, Minneapolis and Detroit. It’s bad enough the Heat now is supposedly competing in the East only with the Pacers. Bringing up the weather, as well. The Heat is still very good, though looking, as expected, more vulnerable this season. And nobody is particularly concerned this time. In previous seasons, when Miami lost ESPN generally produced several specials about what is wrong with the Heat. Miami has lost this season to the 76ers, the Nets, the Celtics and the Pistons, all sub-.500 teams. They started the season 3-3. No one declared the run at an end. LeBron James is still third in the league in scoring at 26 per game. But he’s down substantially in career averages in assists and rebounds. Overall, typically, Miami is last in the league in rebounding. But James is shooting 59.5 percent overall and an amazing 47.4 percent on three pointers. He could win the dunk and three-point shooting contests. James is a truly remarkable player, indeed one of the game’s greats. It shows how hard he works on his game that he’s improved his shooting to this level when it once was considered a weakness. He’s been one of the top athletes in the game, one of the most unstoppable ever on the fast break. Now, James is among the game’s best shooters, easily the best shooting perimeter player in the game by percentage. He’s not Stephen Curry, Klay Thompson or Ryan Anderson. But James is now a reliable cold spell breaker. Good city to be coming to for that. Miami’s game is James’ game as much as the Bulls were Michael Jordan’s. The Heat win with excellent ball movement and spacing and good perimeter shooting both off the defensive attention toward James and now with James. Plus, they are an aggressive defensive team the way they trap the pick and roll on the perimeter and rotate without the use of the traditional big man. It’s why they are difficult to defend, but also why good defensive teams with multiple big men, like the Bulls have been and the Pacers are now, are threats to Miami. Still, even though the Heat trail the Pacers by two and a half games in the standings, Miami remains the favorite to win a third consecutive title. Of course, much of that depends on the health of Wade as the Heat obviously are nursing him along to try to have him and his knees in the best health as possible for the playoffs. Though the 90’s Bulls never quite had to do that, even if Scottie Pippen was in decline in 1997-98, the Heat is approaching the season much as those Bulls did with confidence in the knowledge they’ve done it before and can do it again. The Heat has gotten a nice lift off the bench from former No. 2 overall pick Michael Beasley, back as a low paid free agent and averaging double figures off the bench. They’re shooting an amazing 51 percent as a team and one of the top three-point shooting teams at more than 41 percent. Still, they’re a bit more vulnerable given the status of Wade and the approach to the games. James has a minor back problem, and it’s not like they have to wrestle with every possession or explain every misstep. Though the Bulls offense is paltry in comparison, the Bulls figure to give them a good game. The Bulls are second in the league in field goal defense and rebounding, areas where they can challenge the Heat. Plus, even if Miami doesn’t likely view the Bulls as much of a rival without Rose, the games between the teams have become among the most contested over the last three seasons. The Bulls hold a 7-4 edge in the regular season the last three years. They lost in the 2011 conference finals in five, and again last season, though with that impressive Game 1 win in Miami with several Bulls players out injured after the seventh game win in Brooklyn a few days earlier. But this time it’s a big game for the Bulls and another game for Miami. National TV and the opponent should make it a competitive game for the national audience. It’s too bad Rose will be going home early.